Tutor Perini Corporation, a leading civil and building construction company, announced today that its subsidiary, Tutor Perini Building Corp., has been awarded a contract valued at $285 million by the Pechanga Development Corporation and has commenced work on the expansion of the Pechanga Resort and Casino in Temecula, California. The contract value will be included in the Company’s reported first quarter backlog. The resort expansion project involves adding a new, AAA Four Diamond, 568-room and suite hotel wing; a stand-alone luxury two-story spa and salon with 17 treatment rooms, a fitness center and hydrotherapy pool terrace; a resort-style pool complex with eight pool areas; two new restaurants; and an additional 67,000 square feet of event space. 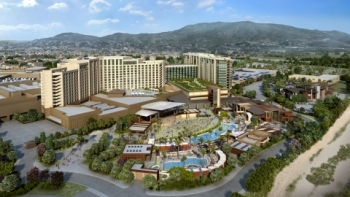 Tutor Perini has enjoyed a successful, long-term partnership with the Pechanga Development Corporation, the economic development branch of the Pechanga Band of Luiseño Indians, and previously completed multiple phases of the Pechanga Resort and Casino over the past 13 years. The project is expected to be substantially completed by the end of 2017.